I think now is a good time for a cheerful-looking cake, don't you? It's been a tough week for many of us. I'll be the first to admit that the recent losses in the headlines made me feel a little lonely. We all have our own way of dealing with these things, and I did what I usually do (aside from snuggling these faces), I baked things - a whole bunch of things. I whisked and whipped and folded and I may have listened to 'Life on Mars' on repeat for two hours straight. During this time I decided to complete a recipe I've been working on for a long time. It's lengthy, so I'd never quite committed to its final scheme. The inspiration comes from a cake I saw at a local restaurant, and its mixed up layers had me awe-struck. My first thought was "Who allowed them to do that?" and my second thought was "I can't wait to do that!" The person who thought up this cake to sell at restaurants was a smarty, indeed. 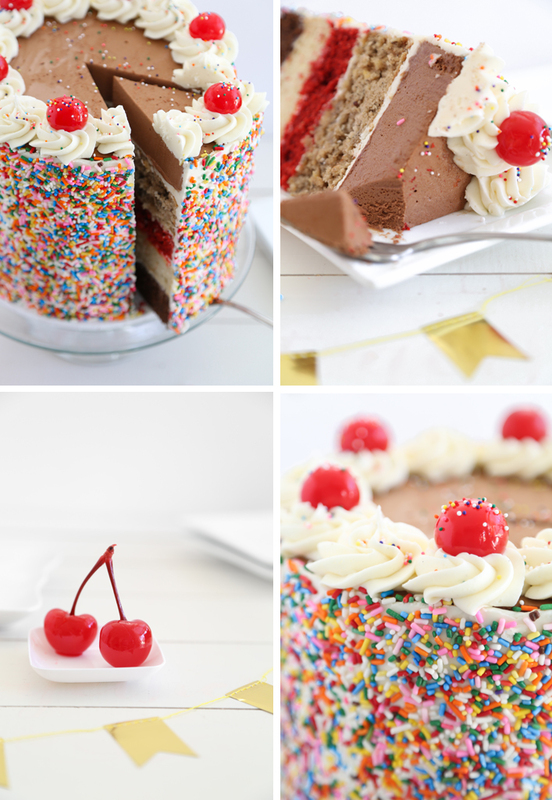 I mean, no doubt it makes a fantastic party cake, but from a diner's perspective, I don't have to choose a single cake flavor because I can have them all in one slice! For this reason I think this cake would be great for bake sales, too. Last year I had inquired about ordering a whole 'sampler' cake from the restaurant (ahem, for 'research'), but it turned out to be too pricey. After that I was bound and determined to make my own. My version of the cake differs from the original in a few ways: It's scaled down to 8-inches (instead of 10.5), I added a chocolate mousse layer and I swapped out their carrot cake for my hummingbird cake. Here's a rundown of each flavor from top to bottom: chocolate mousse, hummingbird cake, red velvet cake, sour cream vanilla cake, and chocolate cake. The entire cake is filled and covered with cream cheese frosting, which gives it a little bit of cheesecake flavor. I wish I hadn't waited so long to make the final version of this cake because it wasn't as difficult or drawn-out as I'd expected. I found a rhythm to washing my pans and mixing bowls in between baking layers. I divided the task over the course of two days: I made all of the cake layers on day 1, and then day 2 was dedicated to stacking, filling, frosting and sprinkling, so maybe that's why it didn't seem too taxing. Speaking of sprinkling, I am often asked how I get sprinkles onto the sides of my cakes. The short answer is, I press handfuls of sprinkles onto the tacky icing. This is always a fun but messy job. No matter how neat I try to be, sprinkles usually end up within a three foot radius of the cake I am decorating. If I'm trying to be super conservative with my sprinkles ,then I'll line my kitchen sink with plastic wrap and place the cake in the sink, then toss or press the sprinkles onto the sides of the cake. This allows the excess to fall onto the plastic wrap. They can be gathered up in the plastic after the cake is all sprinkle-ified, and then funneled back into a bottle. My usual application looks like the picture above. I put the cake on a cake stand, and the cake stand sits in a large baking pan. Then I pick up a large handful of sprinkles and press them onto the cake. The idea is that the sprinkles will fall back into the pan, but as you can see they sometimes hop out of the pan. In other words, have the broom and dust pan handy (smile). Begin this recipe one day ahead of time. The mousse layer needs to freeze solid overnight. If you have Bake Even Cake Strips, then I suggest using them for the cake layers. They will sometimes eliminate the need to level the baked cakes (which was my result except for the red velvet layer). I used (and recommend) Baker’s Joy flour-based baking spray to grease the pans. This reduces the amount of crumbs on the outside of the cake and eliminates the need for lining the pans with parchment paper. When all of the cake layers are baked and ready to be stacked, the flavors can be arranged to your liking; however, the red velvet layer is soft and should not be used as the bottom tier. Because the mousse layer is fluffy and light, it should always be on top. You’ll need about 1 1/2 cups of sprinkles to cover the outside of the cake. Check the ice cream toppings aisle at the grocery store for large containers of sprinkles. If transporting this cake, make sure it is well chilled before departing, and consider doweling it in the center so the layers don’t shift while traveling. Sprinkle gelatin evenly over the water in a medium saucepan. Let stand for 1 minute. Whisk in egg yolks and sugar together well (save the egg whites for the hummingbird cake layer). Stir in hot milk. Cook over medium-high heat, stirring constantly. Mixture will thicken after about 5 minutes. When done, it should be thick enough to coat the back of a spoon. Stir chopped chocolate into the cooked gelatin mixture and blend until chocolate has melted and even in color with no streaks of the yolk mixture. Allow to cool for 20 minutes, or until just warm. Line and 8-inch round pan with plastic wrap so that the inside is completely covered and plastic wrap overhangs all sides of the pan. Whip cream until stiff peaks form. Gently fold whipped cream into the chocolate mixture until well blended. Pour mousse into the plastic wrap-lined pan and smooth the top. Cover and freeze until solid, overnight. When mousse layer is frozen solid, remove from pan and remove plastic wrap. Transfer to a plate and store in the freezer while the other layers are baked and assembled. Preheat oven to 350°F. Grease an 8-inch round cake pan. Combine the first five (dry) ingredients. Add egg whites and oil, mix well. Add vanilla, pineapple, nuts and banana; stir to combine. Pour into the pan. Bake for 20-25 minutes. Let cool in pan 5 minutes. Turn out on a wire rack to cool completely. In a large bowl, combine the dry ingredients (first 5 ingredients). In a separate bowl, gently beat together the oil, buttermilk, egg, food coloring, vinegar, and vanilla with an electric mixer. Slowly add in the dry ingredients to the wet and mix until thoroughly combined. Pour the batter into the pan and bake for 25-28 minutes. Remove from oven. Let cool in pan 5 minutes. Turn out on a wire rack to cool completely. Preheat the oven to 350°F. Grease an 8-inch round cake pan. Whisk together the sour cream, egg, sugar, vegetable oil, and vanilla extract. Sift the salt, baking powder, baking soda and flour over the wet ingredients; mix until smooth. Pour the batter into the pan. Bake the cake for 20-25 minutes, until it is beginning to brown on top. Remove the cake from the oven, and after 10 minutes turn it out of the pan onto a rack to cool. Preheat oven to 350°F. Grease an 8-inch round cake. In a large mixing bowl, beat the cream cheese, butter and vanilla together until light and smooth. Add the sugar and beat on low speed until incorporated. Increase the speed to high and mix until very light and fluffy. Place the chocolate cake layer on a sturdy cake stand. Spread 1/3 cup of cream cheese frosting over the layer and top with the vanilla cake layer, spread with frosting as before and top with red velvet layer; cover with cream cheese frosting and top with hummingbird cake layer, spread with frosting and top with the frozen chocolate mousse layer. If the chocolate mousse layer is larger than the cake layers (they shrink a little in the pans, the mousse does not), trim the edges of the mousse layer so that it is flush with the sides of the other cake layers. Cover the entire cake, except for the very top, in a layer of cream cheese frosting. 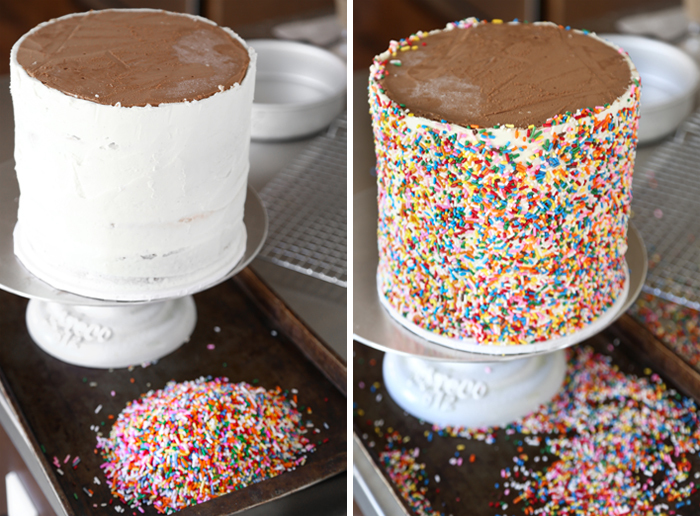 Place the frosted cake in a large baking pan and press handfuls of sprinkles onto the sides of the cake, allowing the excess sprinkles to fall back into the pan (do the best you can with this *wink). Please note! It’s important to cover the cake with sprinkles while the frosting is still tacky, so do this soon after covering the cake with frosting. Transfer leftover frosting to a piping bag fitted with a large star decorator tip. Pipe approximately 12 swirls of frosting around the top edge of the cake. Place a maraschino cherry on every other icing swirl. 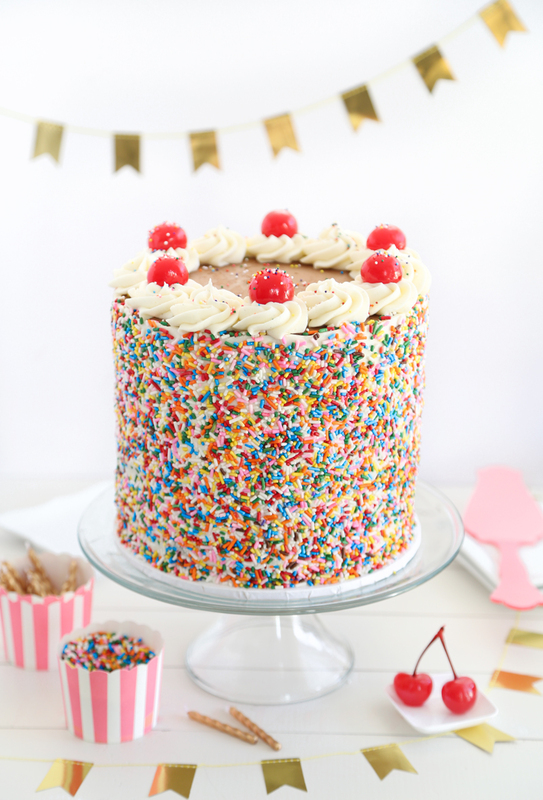 Sprinkle the swirls and cherries with pinches of rainbow nonpareils. Store cake wrapped in plastic wrap in the refrigerator. Bring to room temperature before serving. Huh, reading this I'm surprised to see how relatively easy it is too! And it is seriously a show stopper. 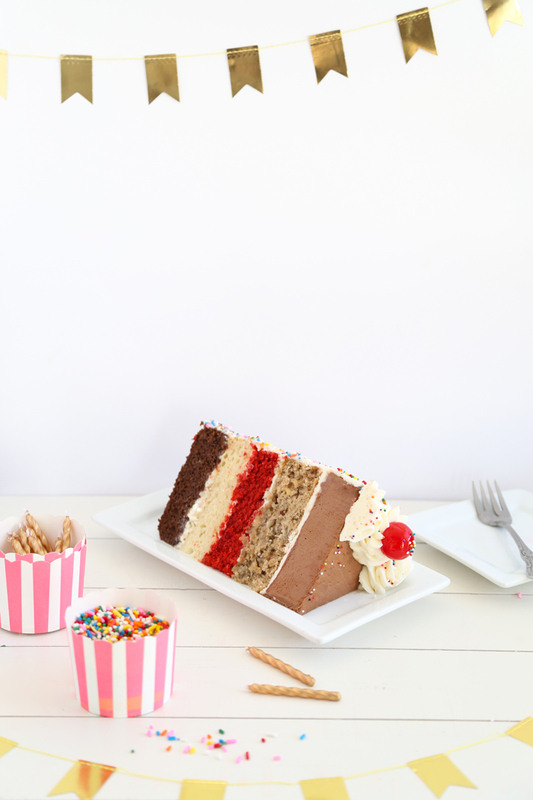 So many scrumptious layers! This cake is OUTrageous! I wish I had your talent to make it for my hubby's bday! In the Midwest we have a cake called an Atomic Bomb. I am trying to remember the layers. I believe it is chocolate cake then a layer of strawberry filling, then banana cake and a layer of banana filling, then vanilla cake topped with fudge and then all covered in whipped cream. Very yummy. Oh wow. Yum! Sounds a little like banana split flavors. Absolutely beautiful...and I'm sure completely yummy! Looks absolutely scrumptious and well worth the effort! What a fabulous party dessert! Thats looks absolutely delicious:) Loved the pics! This is epic and you are a smarty!! Wow that is one crazy cake!! Sounds like the perfect cake for an indecisive baker :P Looks beautiful! Wow! This looks awesome! One question....Would it be alright to substitute walnuts for them in the hummingbird layer? This looks AMAZING, Heather! I'm always in awe of how beautiful your cakes are, but this one is glorious! This looks like the perfect project for days you just want to bake something! So much deliciousness in one project! Hana - yes! I'm sorry for my tardy reply - I somehow missed your question! This post makes my heart sing. How tall is the cake when assembled? The cake layers stacked together are 7-inches tall. About 8 inches total with the frosting swirls and cherries on top. May I ask what food colouring you used for the red velvet cake? Liquid or gel? I would use the gel myself & need to know if I'd use the same amount (1tbsp). Hi! I used liquid red food color, Durkee brand. If you use gel, you could probably decrease the amount by half since it is so concentrated. 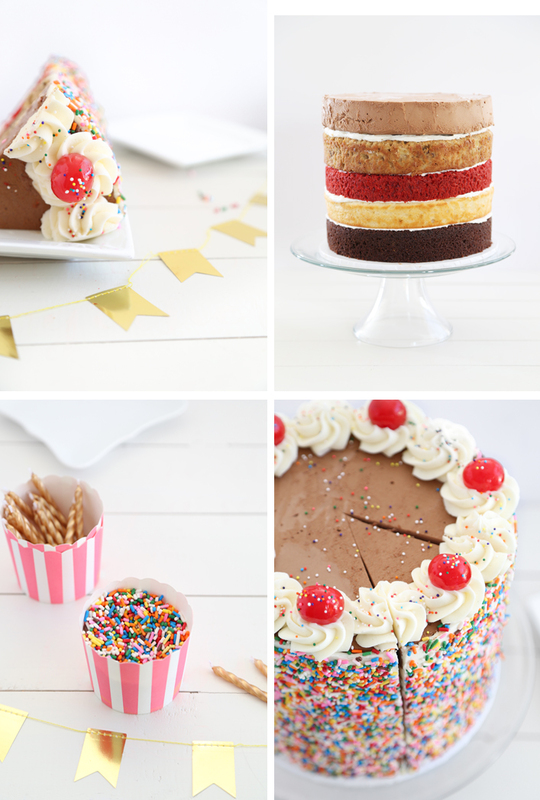 I'd like to try these recipes for an upcoming birthday cake. But I am going to use a 12 inch hexagon pan. Can these recipes be doubled with success? I hope so because I am so intrigued and want to try this cake. Thanks! Hi Patricia! Yes, most of these cake recipes were double or triple layer cakes to begin with and I scaled them down to 1 layer. Thanks for asking! Good luck! The recipe for the mousse layer is missing a part to when do I add the choc. It don't say when and how. In the directions it only mentioned the chocolate once when it says until the chocolate has melted. When was it added? Hi! If you'll look at the second paragraph under 'chocolate mousse layer' (the one that begins with "line an 8-inch round pan" the third sentence in that paragraph says "Gently fold whipped cream into the chocolate mixture until well blended." Does that help? Made this for Easter, which was also my mom's birthday. Did not make the mousse layer and split the cakes into two. One was chocolate and red velvet and the other vanilla and hummingbird. Big hit. My only comment is that some of your gram measurements seem off. 1 1/4 cups of brown sugar is definitely not 310 grams. I'm glad you liked the cake! Thanks for your comment regarding the brown sugar. I've corrected the gram measurement in the recipe and will double check the remainder of the metric conversions. Can i cover this cake in fondant, even with the chocolate mousse layer? I would omit the chocolate mousse layer if you plan to cover the cake in fondant. Take it from someone who made a wedding cake with the top tier composed of three cheesecakes. The moisture from mousse, cheesecake, Bavarian (and similar) will leach moisture at room temperature after a while. This causes the fondant to break down and weep. I suggest replacing the mousse layer with another single layer cake. Maybe cherry chip or funfetti? The directions for the mousse are a little confusing. It seems like after letting the gelatin sit for a min, it's cooked with the egg yolks & sugar but then it says add the gelatin mixture. And it doesn't sepcift when to add the chocolate.... ? Hi Anonymous -after re-reading I agree that it is confusing. I changed the wording and hopefully it is more clear. Thanks for your comment! Good luck! Everything will be okay! It's cake and even if it wilts/weeps a litte it will still taste good! This is such an incredible cake and I found it after reading your "Layers" book blog post for the sprinkle advice! I've been a long time reader, buy I've only just noticed that gorgeous pink cake server. Do you mind sharing where you bought it? Thanks tons! Just made this cake this weekend for my husband's birthday. It was definitely fun to make and what a presentation!! I also made the ice cream sandwich cake for my daughter ( their birthdays are a day apart) which is also an amazing presentation! Thank you for your beautiful recipes!!! I made this cake (minus mousse layer) for my son's 2nd birthday this weekend and it was fabulous! (The chocolate and red velvet were my favorites, and I will totally be doubling and making regular cakes with those recipes in the future.) Such an impressive presentation before cutting, and even more so after cutting! I made the layers one per day two weeks early and froze them; the day before the party all I had to do was make the frosting, assemble, and decorate. Thank you for an easy, beautiful, delicious cake! Hello Heather. Still questing for a great vanilla cake. I did read a comment/question regarding the layers you used. Looks like you scaled them down from the original larger recipe...so, I believe that I can take, your vanilla sour cream cake recipe, and double? Triple? I love tall cakes and typically make 6" and 8". I would love to make this vanilla...would you suggest just to double? Thank you!! Hi Paula! I'd recommend doubling the recipe for a 6 or 8-inch layer cake. 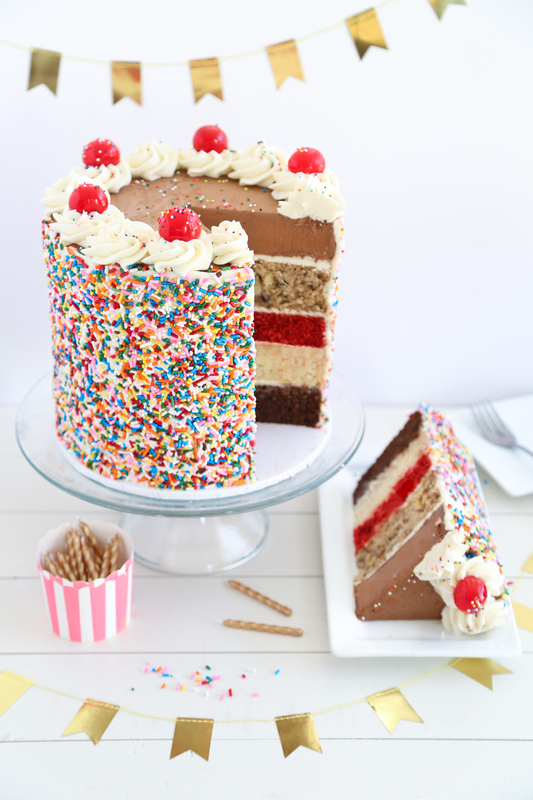 I think if you tripled the batter would yield enough for a 9-inch triple layer cake, which is quite a lot (but good if you need to feed many people). I like sour cream in a vanilla cake because it creates a nice sturdy texture yet retains moisture. Good luck with your research and baking!!! !